Tomorrow (Thursday) might still see some thunder starting to develop from somewhat early on (mainly favouring northern and possibly inland parts of SE QLD) with some of the beefier showers moving in from the NE. But shear and steering winds are very weak so most of the thunder should take the form of slow erratically-moving activity that might give a reasonable drop to a lucky few rather than a tradition organised severe thunderstorm setup. Slightly cooler midlevels inland and a bit of extra moisture should help a bit with the modest instability. Multiweek EC ensemble has been suggesting slightly elevated risk of wetter than normal conditions developing over parts of eastern Australia within the next few weeks but the higher probabilities currently favour areas like NSW. Above is the percentage of models including the members of the EC ensemble dropping more than 1 and 5mm of rainfall between 10pm tonight and 10pm Thursday night via WATL - it clearly shows the northern parts have the better chances of seeing something. Managed several showers this morning, but I don't think any would be heavy enough to register with the heaviest just enough to make the concrete a patchy damp. Just checked in to see how Access r was fairing with its precipitation signal and north/south line out west of divide. Bit disappointed really. Only one storm evident near Glen Innes. 5pm .. wondering if its getting too late for anything else to develop. . Maybe l will check later. However capturing that Nw/Se line nicely and oh my is she firing. Dangerous storms near Sydney and blue mountains l believe. EC +240 hrs - no sign of ridge breaking. Yes looking like a dry January unless something dramatic happens. 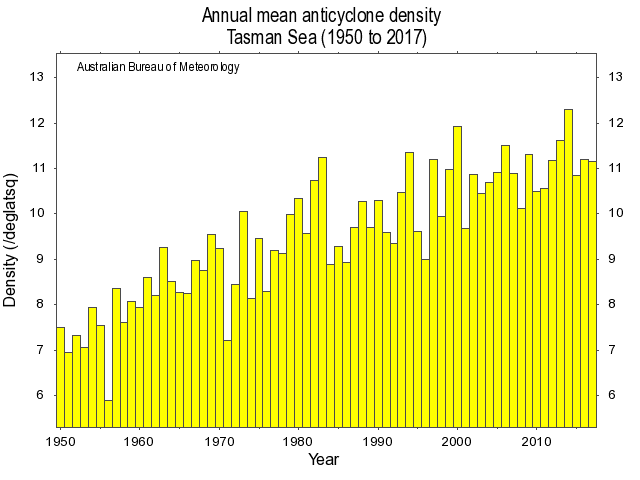 I'm wondering if there are any statistics on long term Tasman dwelling High Pressure systems ie is there any record for the longest serving High to park it's backside in the Tasman sea.This current high might be shaping up as a worthwhile contestant. I've often wondered the same thing TS and I've also often wondered if they were always this regular and long-lasting. I'm not personally aware of any stats about record-breaking highs but there is data on the long term changes in the density and central pressures of highs and lows such as the examples above via the Bureau. The 1st map shows the change in the frequency of highs in summer since 1970 while the 2nd map shows the change averaged across all seasons. The frequency values are calculated from the number of highs per degree of latitude squared per time block. The caveat is that it won't indicate how suddenly or slowly the change has happened unless you look at the time series graphs (but they do generally show the change has been gradual and fairly sustained). 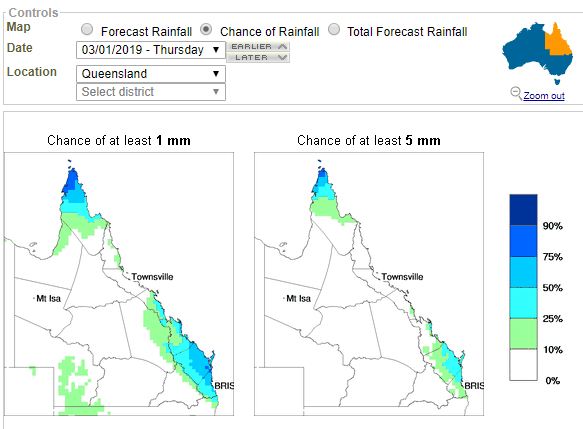 Still looking like the chance of any thunder with the shower activity on Thursday will probably be mainly confined to northern parts of SE QLD with erratic slow-moving activity that has a general tendency to track further inland and little severity. You can see that ALL the high pressure cells are stationary and and appear to be bobbing up and down on top of the contracted westerly belt. O think these are referred to as standing wave pattern. One link to research here. Could have something to do with the Hadley Cell as mentioned in another thread as well. I am not sure MEGA. I have not been following for awhile. That is just what l saw on ACCESS 7 day forecast for the SH. BOM have a few special climate reports from similar circumstances. Blocking Highs in the Tasman. cause heatwaves in VIC and Tasmania no 63 or 64? In this case, how does whats going on in higher latitudes affect the high pressure belt. Yikes, I didn't realise it had been that poor at Tweed Heads. There's been 30 thunderdays (and 28 thunderstorm hits) here at South West Rocks since the start of this storm season. It's been a good season so far. Has been quiet since the ridge began its authoritarian regime at Christmas, but it's fairly normal to get a "lull" in storm activity at some point during the summer (with this usually happening in either January or February). Almost like a mid-season break between the 'primary' and 'secondary' parts of the storm season. Not really a surprise IMO We’ve had some decent but brief downpours here so far this morning, one of which woke me up. I was looking at upper charts yesterday I think to see what was happening with TC Penny and was surprised to see an upper level low overhead. Very weak though. Nice to have an upgrade to 5-20mm expected today for SS coast. Will all these cyclones sitting up north draw the moisture away as in past cyclones or are they not a big enough system to do that? PAST 24 WEATHER SUMMARY... Overnight and early morning showers. Interesting thanks for your research on High Pressure systems Ken and Mega, that graph re the strength of highs showing a gradual but strengthening of them is a concern.